This lovely loft in the Powerhouse Arts District of Jersey City, NJ was recently catified to create a kitty paradise! Laura Z. wanted to transform the space for her six permanent resident cats, plus revolving fosters, while keeping the design light and airy. The 1495 sq. ft. studio loft is in an historic former grocery warehouse that’s been converted to artist live-work spaces. Laura’s goal was to create lots of vertical space for the cats to use since the loft has no separate rooms where the cats can get away from each other. She worked with interior designer Andrea Brodfuehrer of von b interiors to create a fabulous cat superhighway using the step shelves from ContempoCat painted white in combination with Ikea shelves and custom built shelves that have decorative brackets to match the decor. Over the desk, Laura added another climbing wall so the cats can be nearby when she is working without being on her desk. In the middle of the desk climbing wall is a box embellished with decorative white frames, creating kind of a shadow box for cats. In the living area, Andrea designed some very unique climbing shelves that appear to fade into the lavender wall. The cats can access the decorative shelves from small steps on either side. Surprisingly, none of the cats has knocked off the decorative vases or books! Thank you to Laura for sharing her beautiful home with us! Photos by Wendy Ploger. NEW! Bubble Pod Window Cat Bed! Many. many thanks for the New Jersey loft pictures for six cats and fosters. My situation is similar although I have a few more walls to “catify” Thanks for the link to Contempocat; their steps and towers seem to be shapes that will work for me. I appreciate the many good ideas in the Hauspanther blog and have made purchases from vendors brought to my attention. Thank you–and your cats–for trying out new products and passing on to your readers the ones that worked. Just a note for other readers who might also find bending to scoop several litter boxes several times a day difficult or impossible. 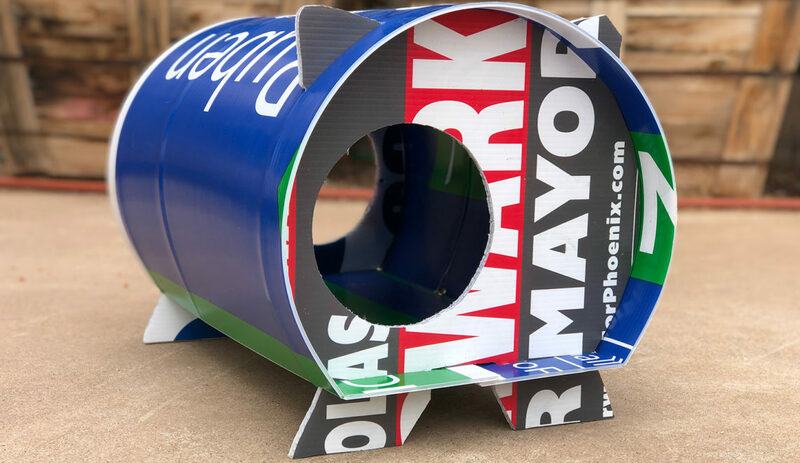 I loved the raised Litterworks concept, but none of the Littermaid products were what my large cats would use without damaging the motors. I have been using Litter Robots with success for several months now and plan to expand my count from 2 to 5; I will keep one normal box just for slow learners! 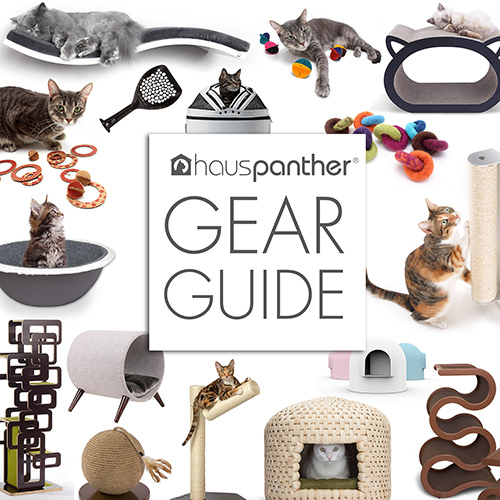 Cats are great companions for older, physically impaired adults, but we need more stylish, functional products to help us be independent in our care of our cats or fosters. Thanks. the only problem i see with auto litter boxes is that (especially if you have several cats) you might not notice when one is having a problem that leads to a UTI or other health issue. the problem with covered boxes is that, unless they are extremely well ventilated and you are using dust free litter (more expensive), the cat is trapped inside with all the dust when digging. i have 7 litter boxes and have strategically located some where i can sit on something while scooping. i have a little step stool that i sit on for the others. one of the litter boxes is located in the garage in a screened in (to keep bugs out) box with a lid that lifts up for cleaning the litter box. it’s accessed thru a kitty door in the laundry room. in a perfect world i would have all the litter boxes located in the garage. i do have one on the catio and two on the adjoining covered patio. the others are in the house where i’ve managed to put a short folding divider around them so the cats only enter on one end. i’m also curious about the city code in new jersey for the number of cats you can have. our city code is three, altho i do have more. however, besides my house, the cats have 1100 sf of totally screened area outside. i just keep a low profile. i meant to also say i really like your shelving. i’m wanting to put some inside my house as well. Love it! Where is the bench at the end of the bed from? I bought the bench from Cottage Chic in North Carolina. My bedding is also from their website! a beautiful space for all ! but – i really need to know where to get the fade out shelves from the last photo – if they are not available for purchase, some instructions on a diy ? thanks & i’m keeping this article for when we build our home ! They were custom made! If interested I can put you in touch with my decorator who had them fabricated for me. The bottom are pieces from Architectural Depot, and laser cut to fade.